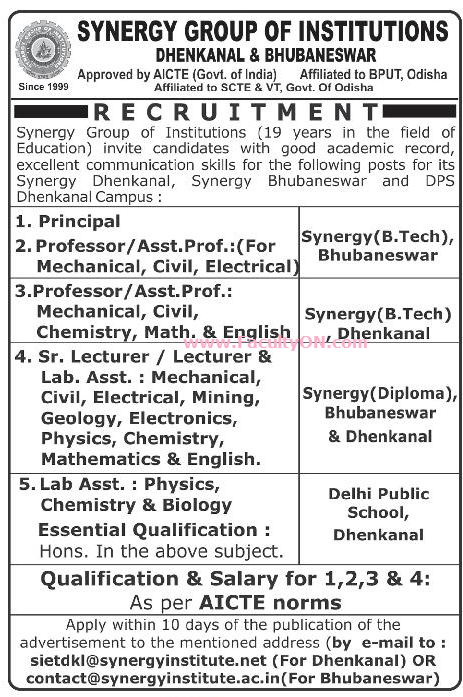 Synergy Group of Institutions, Dhenkanal has advertised in the SAMAJA newspaper for recruitment of Teaching Faculty- Principal / Professor / Assistant Professor / Lecturers / Senior Lecturers / Lab Assistants jobs vacancies. Interested and eligible job aspirants are requested to apply within 10 days from 22nd June 2018. Check out further more details below. About College: A long cherished dream of Shivani Educational and Charitable Trust, SYNERGY took shape in the year 1999.At a distance of 70kms. from the state capital Bhubaneswar on NH-55, well connected by Road & Rail, blessed with a salubrious climate, adorned with the historic Temple, and surrounded by a cluster of mines,mega steel, aluminium & power plants & has achieved to its credit 17 years of glorious track record.Synergy achieved the rare distinction of Accreditation by NAAC(UGC),Govt. of India approved by AICTE and affiliated to BPUT. Lab Assistants- Biology, Physics, Chemistry & in some engineering departments. Refer the advt for more details. How to Apply: Interested and eligible candidates are requested to send their updated CV with all copies of certificates / testimonials and recent PP size photo to the email address mentioned below.